Green Park is a Royal Park and is the most natural of London’s central parks. It consists of 19 hectares of rolling wooded meadows. There are no lakes or buildings unlike the other central London parks. The park is triangular in shape, the base of the triangle being formed by Constitution Hill (with the gardens of Buckingham Palace beyond), Piccadilly to the west and Queen’s Walk to the east. 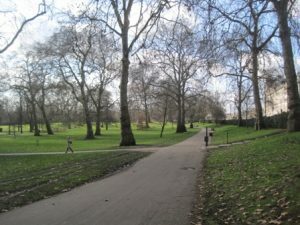 The park connects St James’s Park in the east to Hyde Park in the west. Buckingham Palace is located at the south-eastern corner of the triangle.